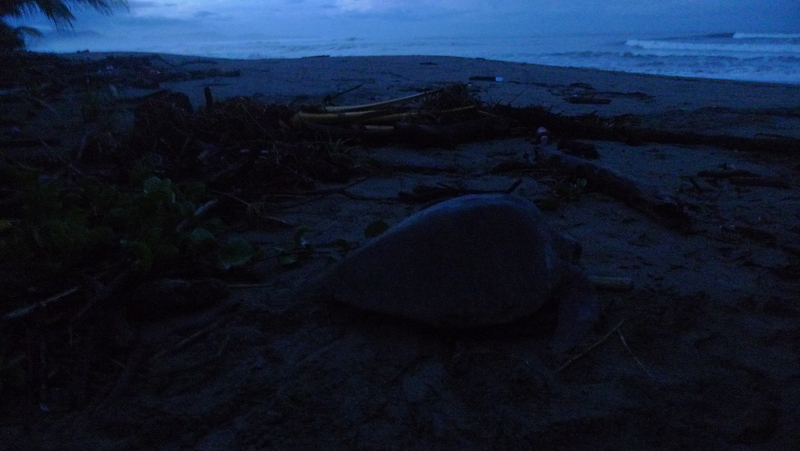 Most mornings find me on the beach before sunrise; there’s always a slight chance to witness an adult olive ridley finishing her egg-laying duties. 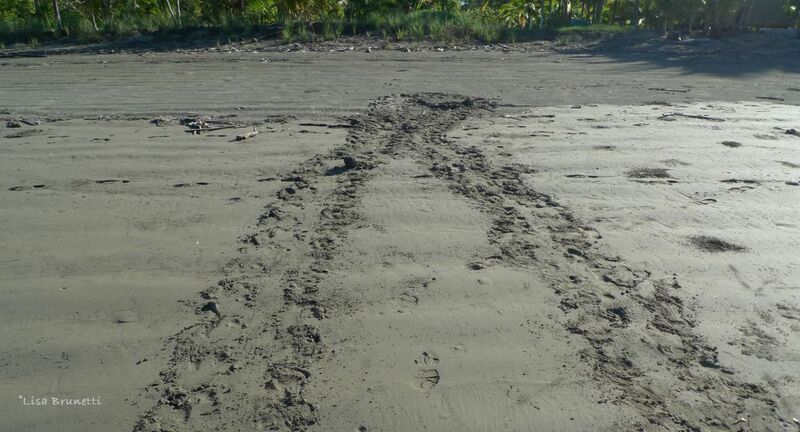 The turtles leave an obvious trail, which I follow to see who reached it first: poachers or the biologists and volunteers for Pretoma. This beauty provided photo ops of her egg-laying trance. 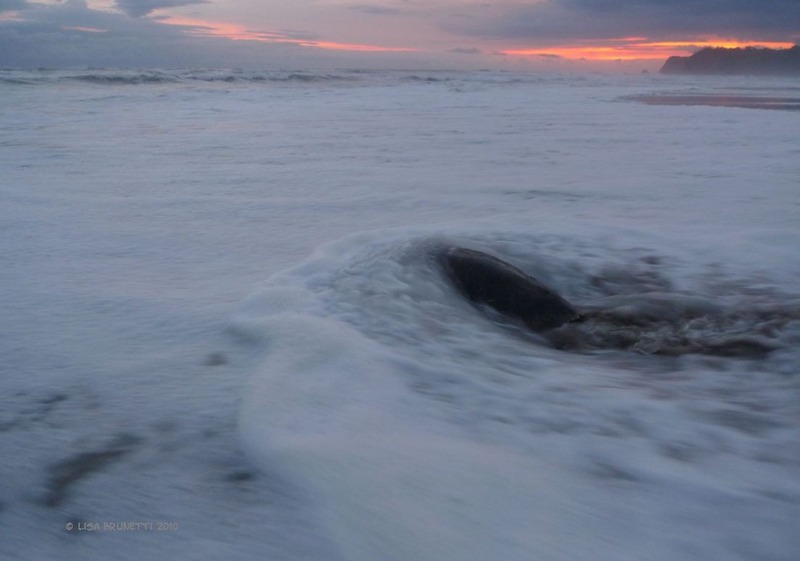 The above turtle came ashore right before sunset. The one below was a dawn surprise! While covering her nest, this female was choked by a tangle of roots and vines. I was able to break her free. Most of the time the turtles come ashore under the cloak of darkness. 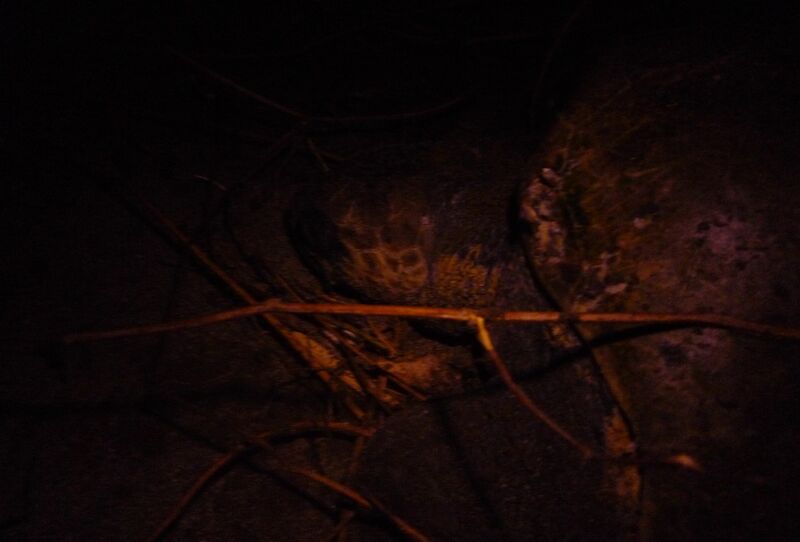 The biologists and volunteers patrol the beach during the night. 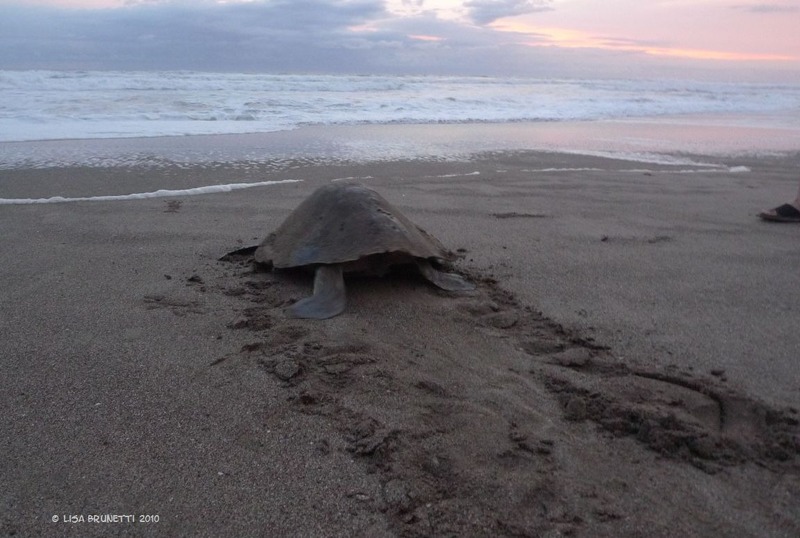 They collect data and oversee the turtle until she returns to the ocean. They transfer the eggs to a nursery, where they are buried at the same depth as the original nest. 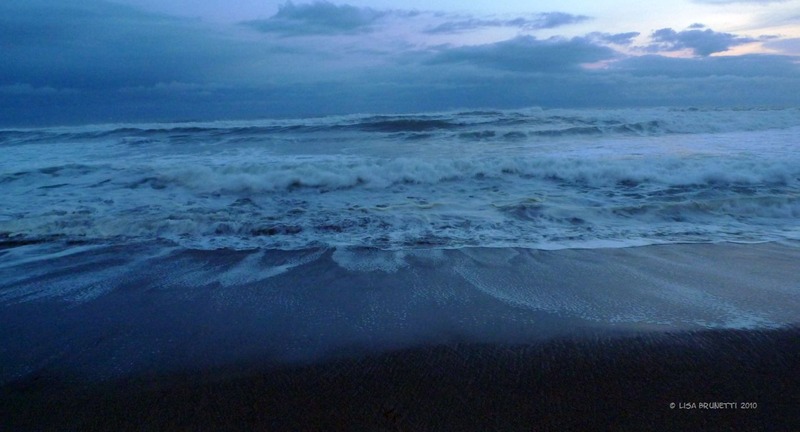 In forty to sixty days, the eggs hatch and answer the call of Mother Ocean! GPS imprint – in a dozen years she might return! 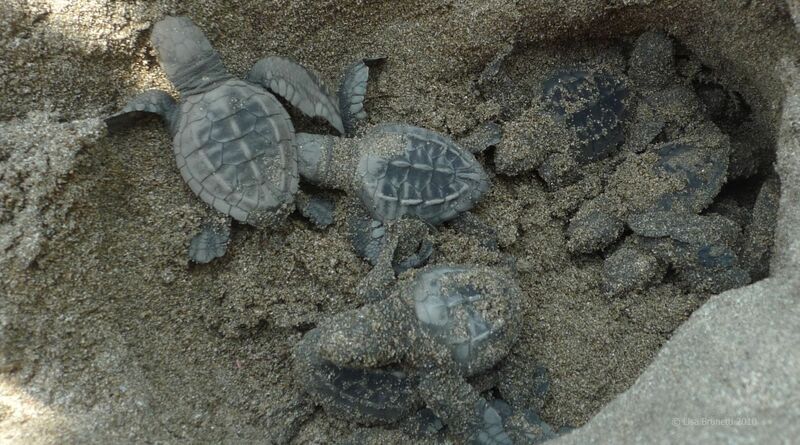 How fun it is to witness the baby turtles’ first hour of life! 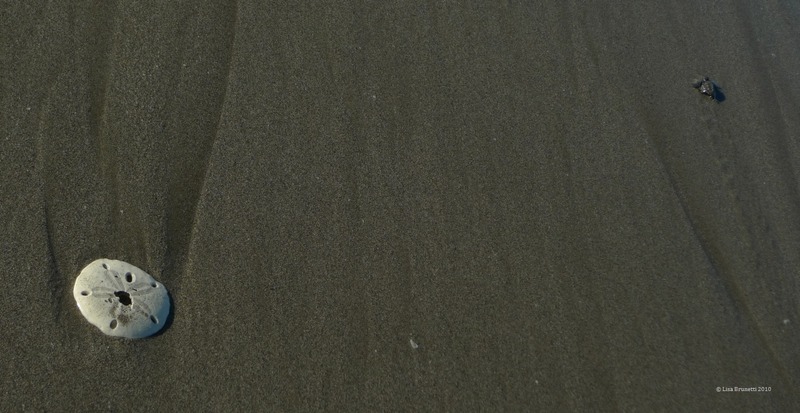 They emerge from the sand and instinctively veer toward the sound and aromas of the ocean. 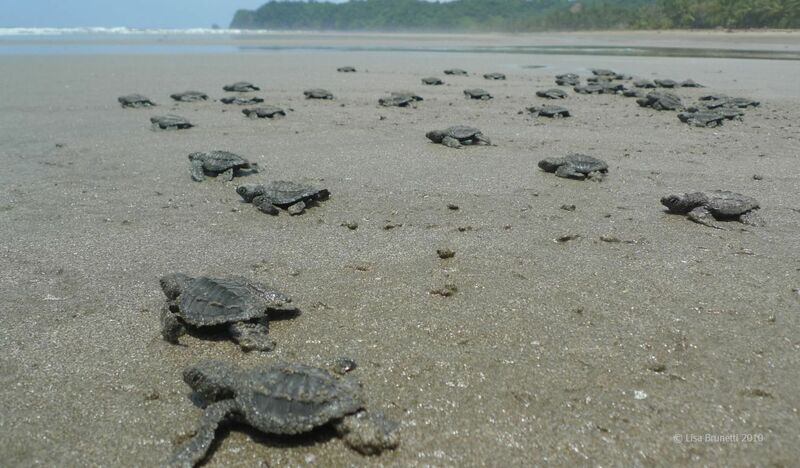 When released from the nursery, the tortugitas stop and imprint numerous times before reaching the ocean. First they learn to crawl; then they learn to swim! They will travel vast distances for a dozen or more years, then magically respond to the mating call and return to their beach of origin. 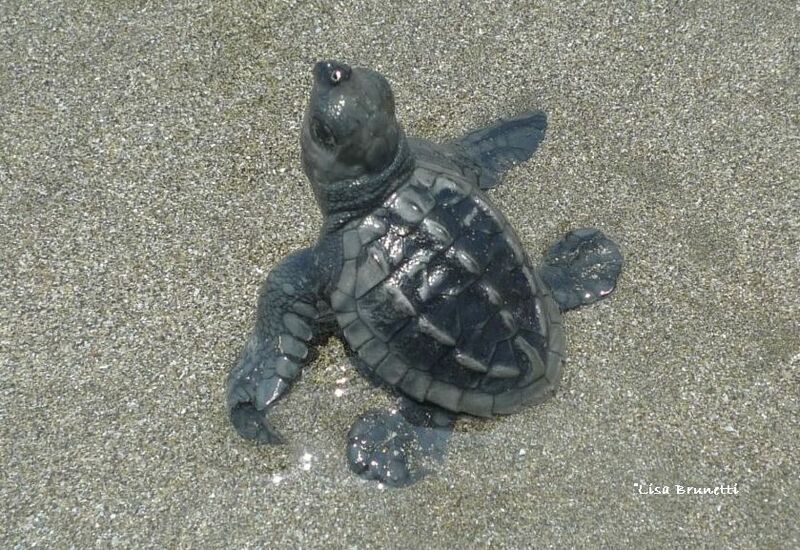 Swim your heart out, little one, and carry with you the GPS positioning of your birthplace! The beach sentinels welcome the turtles’ return. A dozen years later internal stirrings nudge her back, and the cycle continues. After laying her eggs, she retreats to her rightful home. Perhaps she loiters nearby and welcomes the hatchlings. How many do you think will return? For an in depth peek into the battle to protect the olive ridleys, see THE RED LIGHT DISTRICT on my other site. how great! i don’t think the ones over here migrate that far, but if they did, i’d ask one to deliver you a token note!!! it’s sad how they’re declining, and modern man is the biggest reason. For those who subscribe to Playamart, perdon receiving this twice! your post will surely be an interesting one. i look forward to reading it, though i will be on the road at sunrise and not back home til the end of the day. it’s nice knowing there’s a reward of a post that will be patiently awaiting my attention! yes, that was an amazing moment. it had been about twelve years since i had lived there (for ten years) and for some reason i awakened at the perfect moment. one minute later, and we would have been away from that territory. probably one minute before we had flown over/near where i grew up. maybe that’s where the nudge started! 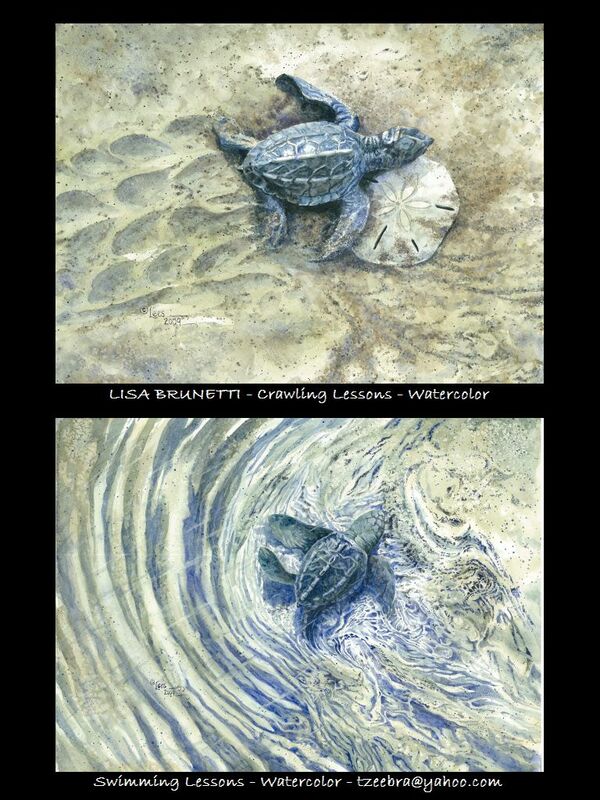 Love the photo narration and really love your watercolors. So delicate. I read your red light district which is written with such depth, passion and understanding and did I say adventure through a lightening storm. Wow! thank you so much for your tireless and genuine interest! 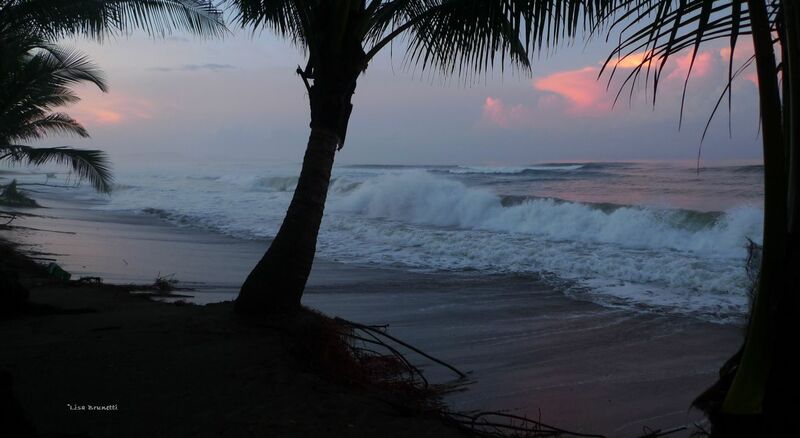 a friend sent photos yesterday from playa san miguel. two shrimp boats were trawling way too close to shore, which is illegal, but it’s rarely enforced. Need to replace the “like” button with a LOVE button 🙂 Great post, fantastic photos..love the paintings, then again, I love all your “stuff”..
Beautiful narration! Love your painting. I’m smiling, too. Thank you! The olive ridleys are special creatures, though all of nature’s creatures are special to me! thank you so much for the pingback!!! Oh my word zee this is such a beautifully written, beautifully illustrated and altogether encouraging post that I’ve read it twice. How do those baby turtles know where to go? Us humans are helpless – HELPLESS – for the first few YEARS! And we’re the one’s claiming “ownership” over all gods creatures. 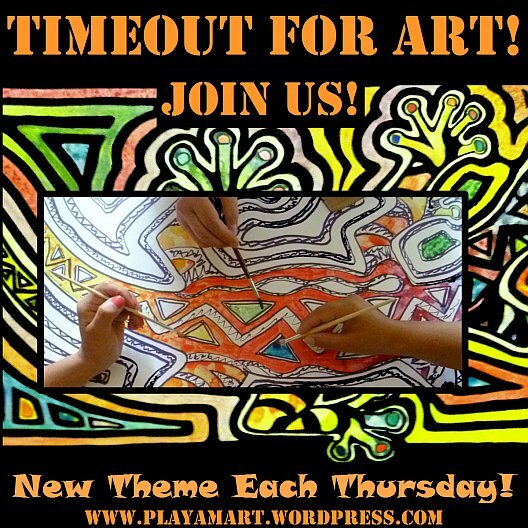 I have to ask you where you get the time and energy to write two blogs and almost every day? Do you sleep at night? ha ha ha! actually you will be surprised that i suffer from extreme tiredness almost all of the time. most likely i have narcolepsy, and i am not one to take stimulants to stay awake. i have found that the best remedy is to stay busy! as long as i am active, i am not sleepy, but if i stop, wham! fatigue sets in! i can go to sleep in about half a minute, anywhere, any time, even if i have just slept for a ten hours! a ten-minute nap in the daytime does wonders for me, and i am up and ready to roll again… or i surrender and sleep … but if i get five or if i get ten, i still feel the same fatigue, so i get up and roll when i first awaken1!! when i go drift off, the dreams are up and running like movies! i eat well, get plenty of exercise, and i try to get 8 hours’ sleep each night, but when i am working on a painting or a post, i work until it’s finished or i reach a good stopping point! 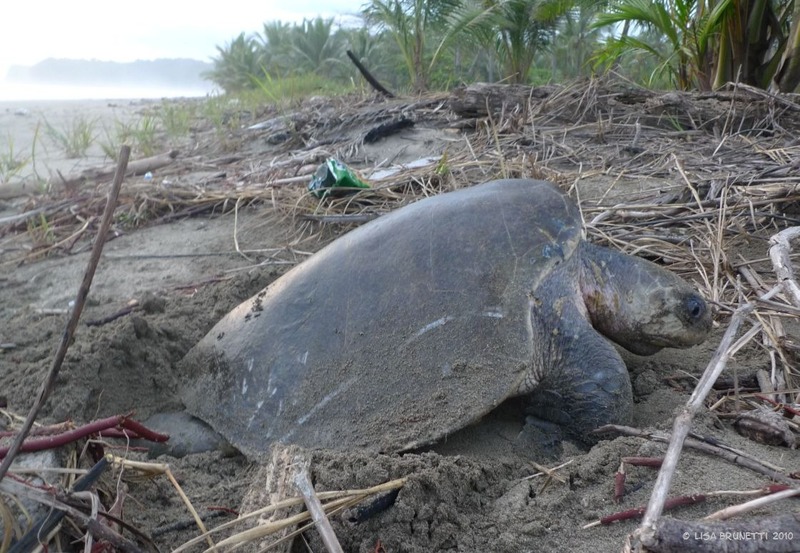 i am honored that you enjoyed the olive ridley post. 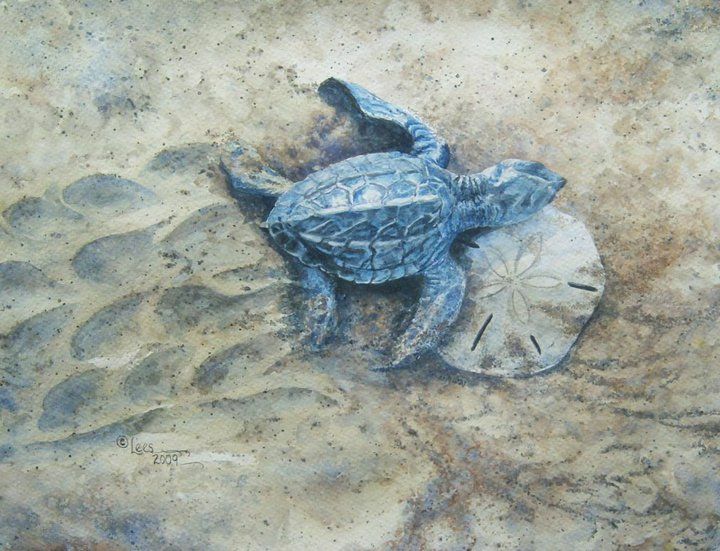 it’s amazing to witness those little turtles from the moment they emerge from the sand.. they make me aware of the ocean’s mist/sound,smell – all which certainly plays a role in their urge to go to the water. at night the lights from civilization compete with the light on the waves/phosphorescence and they go to the strongest light source. modern mad oftentimes negates mother nature’s progress. Wonderful post. And your watercolours are exquisite! Grracias, Amiga! I packed my watercolors and brushes for this trip and hope to find some quality time while travelling. So far I have not, but think that on Thursday and Friday, I will. Thanks so much for the link to get here Lisa, this was a magical post. I wonder what it is about these wonderful creatures that captures all our hearts!